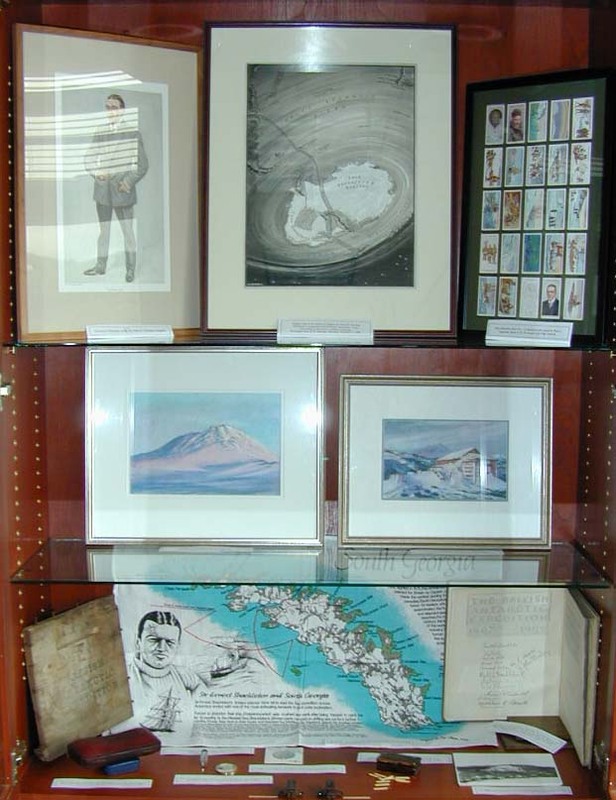 CRREL--The Cold Regions Research and Engineering Laboratory--will be hosting an exhibit of Antarctic Art & Artifacts and Other Assorted Odds & Ends from the collection of Robert B. Stephenson. It will run from June 19th through October 31st, 2000. CRREL, a US Army facility, is located at 72 Lyme Road (Route 10) Hanover, New Hampshire 03755. The exhibit is open to the public without charge, Monday-Friday, 9-4. 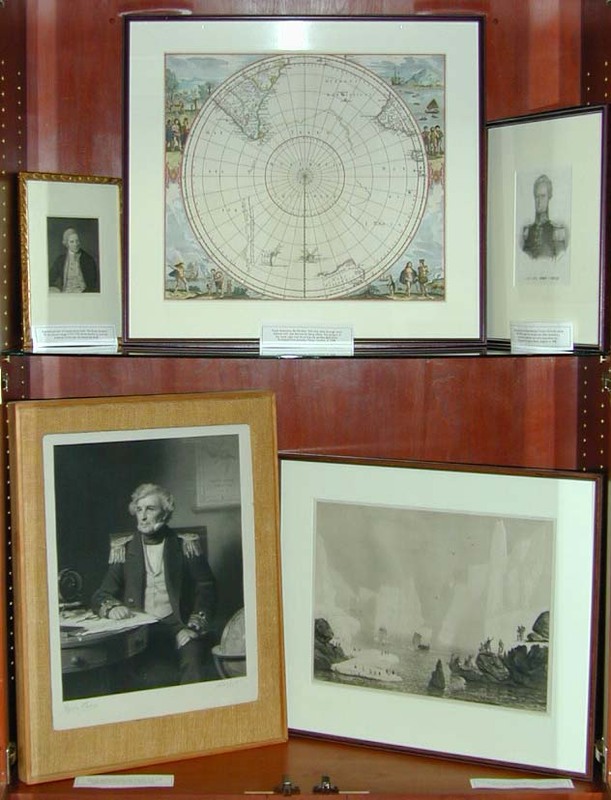 Robert Stephenson has been collecting Antarctic books for many years and from time-to-time an artifact or painting would come his way. This exhibit focuses solely on the non-books in his collection. 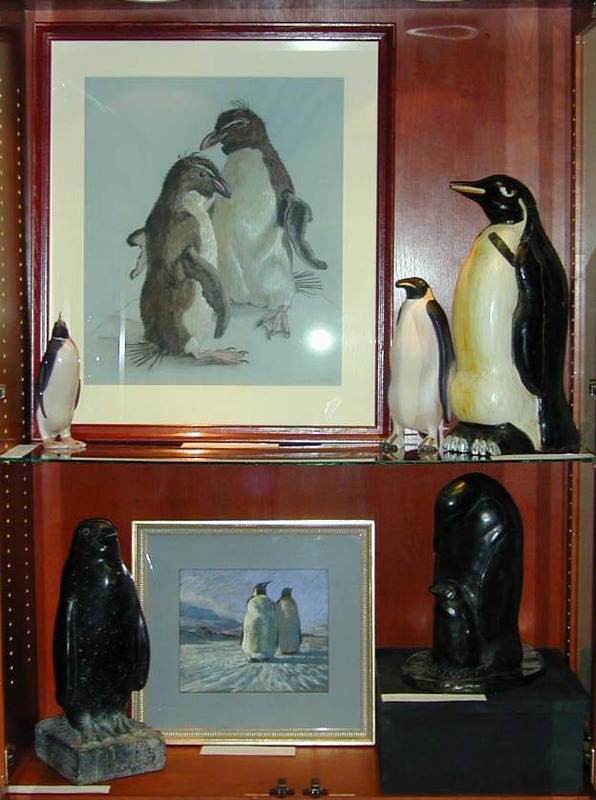 Included are paintings, photographs, maps, sculpture, coins, medals, stamps, cigarette cards, clothing, artifacts and, of course, penguins, in all sizes and materials. 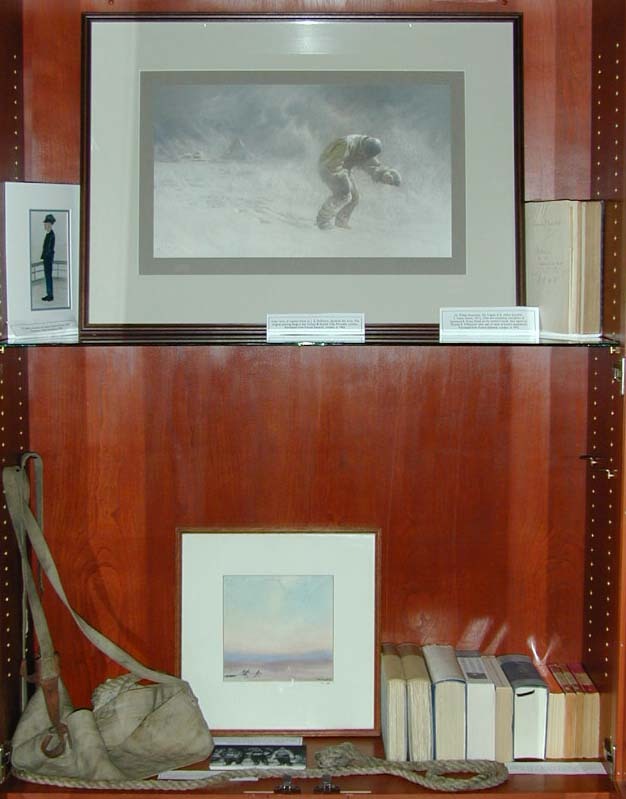 Some of the highlights: Matches from Shackleton's Cape Royds hut; Captain Scott's pipe retrieved from the tent where he died on the return from the Pole; wood fragments from Shackleton's Endurance; hairs from Byrd's sleeping bag; the sledge harness used by Apsley Cherry-Garrard on the "Worst Jourrney;" an unopened tin of cocoa from the Cape Evans hut; Shackleton's pipe case, presented to him by the cabmen of Hyde Park Corner; and much more. Arranged top to bottom, left to right. Click on the case numbers to see a photograph. Two Penguins. Pastel by Elizabeth Saltonstall of Boston, Massachusetts, a relative of Marie Byrd (Mrs. Richard E. Byrd). It was drawn from life, the same penguin--living, briefly, in Byrd's Boston bathtub--posed twice. Wood penguin, probably carved in India c. 1950s. The Emperors. Pastel by Lucia deLeiris of Waltham, Massachusetts. 1997. Penguin and Chick. Bronze sculpture by Katherine Tod Johnson, No. 4 of 100. Engraved portrait of Captain James Cook, 'The Great Navigator.' On his second voyage (1772-1775) he was the first to cross the Antarctic Circle (also the second and third). Polus Antarcticus. Hondius. This map first appeared in 1641 and went through many editions with new discoveries being added. The penguin in the lower right may be among the earliest depictions. Lithograph portrait of Jules-Sebastian Dumont D'Urville whose 1838-1840 voyage in the Astrolabe and Zélée resulted in a monumental publication and some stupendous art. Mezzotint portrait by Stephen Pearce of Sir James Clark Ross, discoverer of the Ross Sea, Ross Island and the Great Ice Barrier. In his time judged to be the handsomest man in the Royal Navy. Grotte sur L'Ile Enderby. Tinted lithograph from Dumont D'Urville's Atlas Pittoresque, Plate 170. Paris: Engraved by Lemercier, 1841. One of a pair of Sheffield plate candlesticks owned by Captain Scott, with his crest. Menu from the Farewell Dinner of July 6, 1901 given at the Savage Club, London, for members of the National Antarctic Expedition (Discovery), signed by Scott, Shackleton, Royds, Skelton, Armitage and others. Caricature of Captain Scott by Spy appearing in The World. Scott's Hut II [Cape Evans]. Watercolor by Lucia deLeiris of Waltham, Massachusetts. 1997. An unopened tin of Fry's Cocoa retrieved from Scott's Cape Evans hut by Harry Francis in the 1950s. Terra Nova Meets the Fram. Color lithograph by Wally Herbert. No. 42 of an edition of 250. London: Atlas Limited Editions, 1999. This chance meeting of Scott and Amundsen's ships occurred on February 3, 1911. Sketch of penguin by E. R. G. R. ("Teddie") Evans. Signed by him. Postcard portrait, signed, of E. R. G. R. ("Teddie") Evans and letter from Evans to Mrs. Thomas S. Williamson, whose husband was on both Scott expeditions. The Soldier, a caricature of Captain Oates by Dennis Lillie. 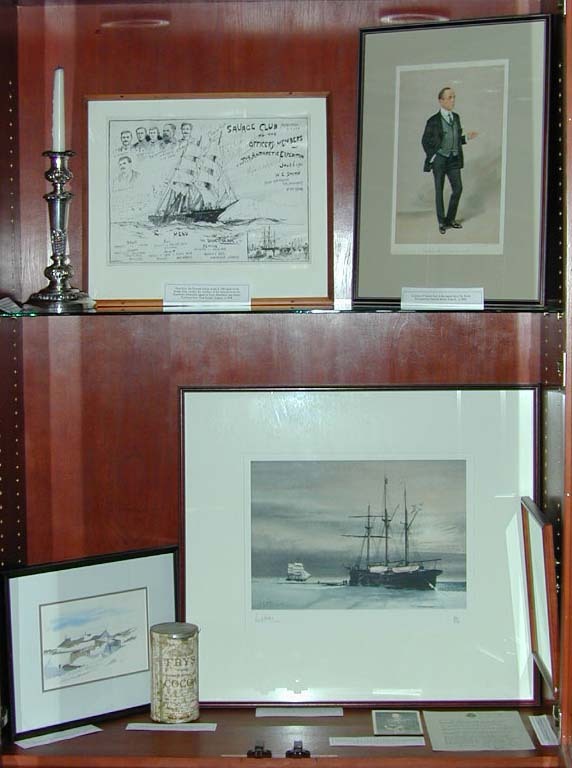 Color print of Captain Oates by J. G. Dollmann, signed by the artist. 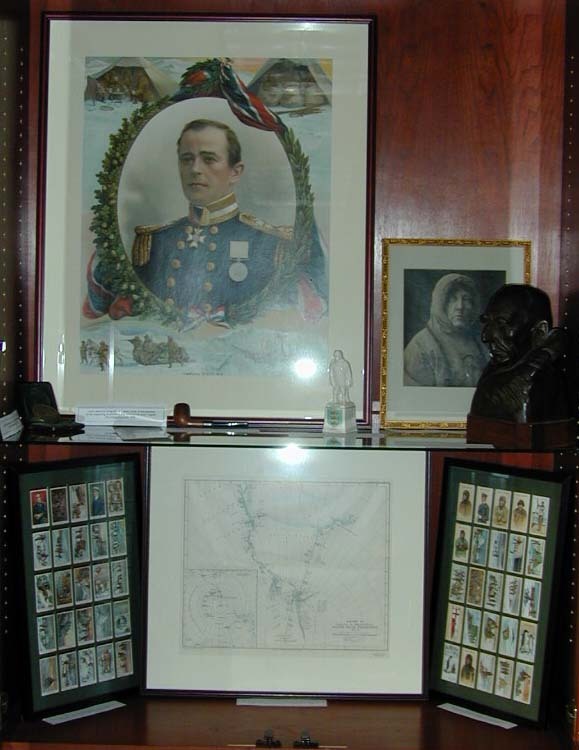 The original painting hangs in the Cavalry & Guards Club, Piccadilly, London. Sir Walter Runciman, The Tragedy of St. Helena (London: T. Fisher Unwin, 1911). With the ownership inscription of Lawrence E. Grace Oates (in his mother's hand). Also signed by Thomas S. Williamson who was on both of Scott's expeditions. Apsley Cherry-Garrard's sledge harness used by him during the Worst Journey and shown in the photograph taken as he, Wilson and Bowers set off for Cape Crozier on June 27, 1911. Minus Fifties, watercolor by Apsley Cherry-Garrard, signed by the artist. This scene of three men sledging depicts the 'Worst Journey' to Cape Crozier that was actually done in winter darkness. Numerous editions of Cherry-Garrard's Antarctic classic, The Worst Journey in the World, including the first edition, 1922. It's never been out-of-print. The Worst Journey refers not to Scott's tragic polar journey but to the winter journey of Wilson, Bowers and Cherry-Garrard to Cape Crozier to retrieve Emperor penguin eggs. Color memorial lithograph of Captain Scott. A fine example of the outpouring of sentiment that followed the polar tragedy. Autographed black and white photographic portrait of Roald Amundsen. Scott Memorial Medal, struck in bronze by the Royal Geographical Society. Captain Scott's pipe, retrieved from his final tent on the return from the Pole. Photograph of Scott with his pipe, along with Edgar Evans, Birdie Bowers and Edward Wilson. Photograph of Scott's last tent as it was found by the search party in 1912. Porcelain memorial statuette of Captain Scott with the seal of Hull. Other English cities issued the same statuette. Bronze bust of Roald Amundsen by the Norwegian-American sculptor, Trygve Hammer, c. 1930s. With Captain Scott at the South Pole. Collectors cards issued by Fry's Chocolate. Series of 25. Map Route of Captain R. Amundsen's South Polar Expedition 1911-1912. From the Geographical Journal, 1913. London: Royal Geographical Society. Polar Exploration Series No. 2. Collectors cards issued by Players Cigarettes. Series of 25. Caricature of Shackleton by Kite, for Vanity Fair. Original map of the Antarctic Regions by G. F. Morrell, showing Shackleton's proposed trans-Antarctic expedition route, presumably produced for publicity purposes. Polar Exploration Series No. 1. Collectors cards issued by Players Cigarettes. Series of 25. Erebus II. Pastel of Mt Erebus, Ross Island, by Lucia deLeiris of Waltham, Massachusetts. 1997. Shackleton's Hut, Cape Royds. Pastel by Lucia deLeiris of Waltham, Massachusetts. 1997. End of wood packing case from Shackleton's Cape Royds hut. Shackleton--South Georgia tea towel showing route from King Haakon Bay to Stromness. The Antarctic Book, Winter Quarters 1907-1909. The third volume of the Edition Deluxe of The Heart of the Antarctic (London: W. Heinemann, 1909) including the signatures of every member of the shore party. Dunhill pipe case presented to Sir Ernest Shackleton "by the cabmen of Hyde Park Corner" in 1921. Wood fragments from Shackleton's ship, Endurance. Silver medallion issued in 1972 to commemorate the 50th anniversary of Shackleton's death. £2 silver coin issued by the Falkland Islands featuring Shackleton with the Endurance on the obverse. Metal match box with matches retrieved from Shackleton's Cape Royds hut by Conrad Larson in the 1950s. Photograph of Shackleton's Cape Royds hut taken by Conrad Larson in the 1950s. The Conqueror of One Pole Attempts the Other. Commander Byrd, the Antarctic 1929. Color print issued by the Wright Aeronautical Corporation, 1928. American flag carried by Byrd over both poles and presented to Albert Bumstead with accompanying letter written from Dublin, New Hampshire, to North Conway, New Hampshire. Two photographs of Albert Bumstead, who made a sun compass for Richard Byrd, one showing him and Byrd inspecting the compass, which is now at the University Archives at The Ohio State University. Holy Bible, from Byrd's base station (Little America). Back Home. Words and music by Irving Kahal, Sammy Fair and Pierre Norman, respectfully dedicated to Rear-Admiral Richard E. Byrd. Hairs from Admiral Byrd's caribou sleeping bag. Richard E. Byrd lapel pin and pin of the Byrd Polar Research Center. 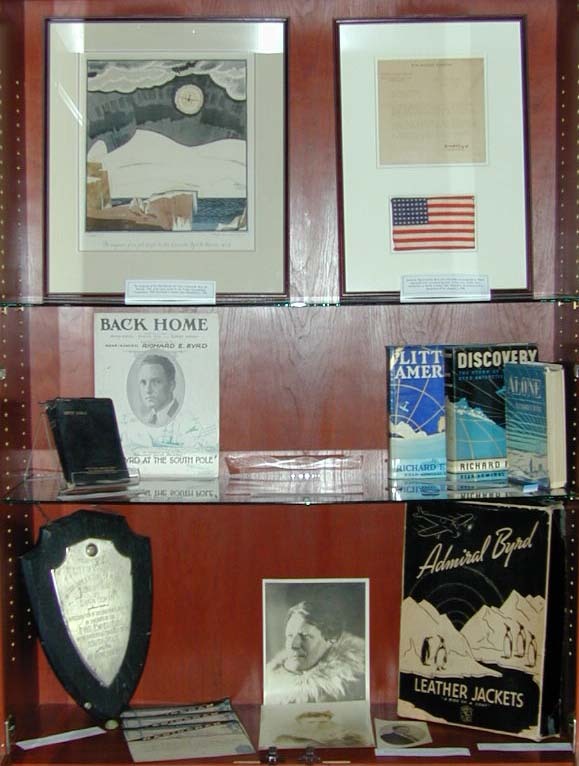 Richard Byrd's three Antarctic books: Little America (1930), Discovery (1935) and Alone (1938). Mounted metal plaque, presented to Dr. Dana Coman, physician on the first Byrd expedition, by Boston Mayor James Michael Curley on June 27, 1930. Photographic portraits of Dr. Dana Coman, Larry Gould and Bernt Balchen, all members of the Byrd Antarctic Expedition (1928-1930). Cardboard Box, Admiral Byrd Leather Jacket. Watercolor of Antarctic icebergs by A. V. Vickers, 19th century. Watercolor, Antarctic scene by Daphne Shackleton, 1999. 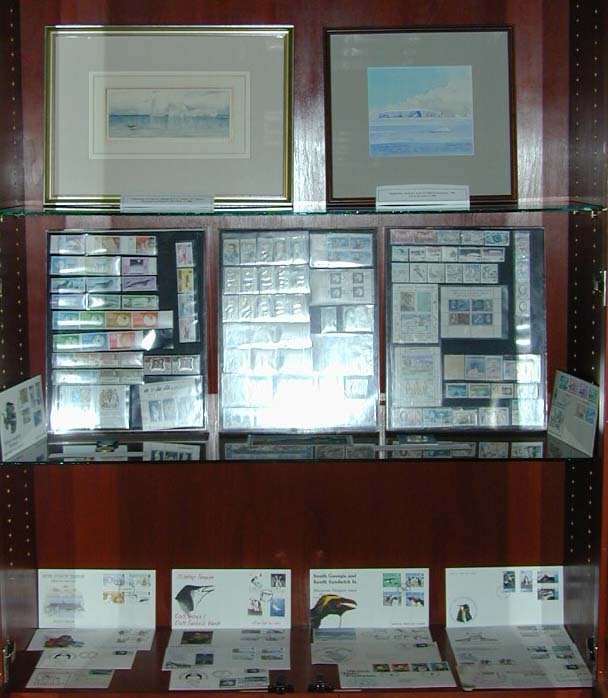 Assorted Antarctic postage stamps and covers. United States Antarctic Service Medal and a Byrd commemorative medal. South Polar Diamond Anniversary Medal issued by the Canterbury Museum, New Zealand, in 1971-1972. Scott on one side, Amundsen on the other. Woodblock print of penguins by Kim Cunningham with accompanying poem. 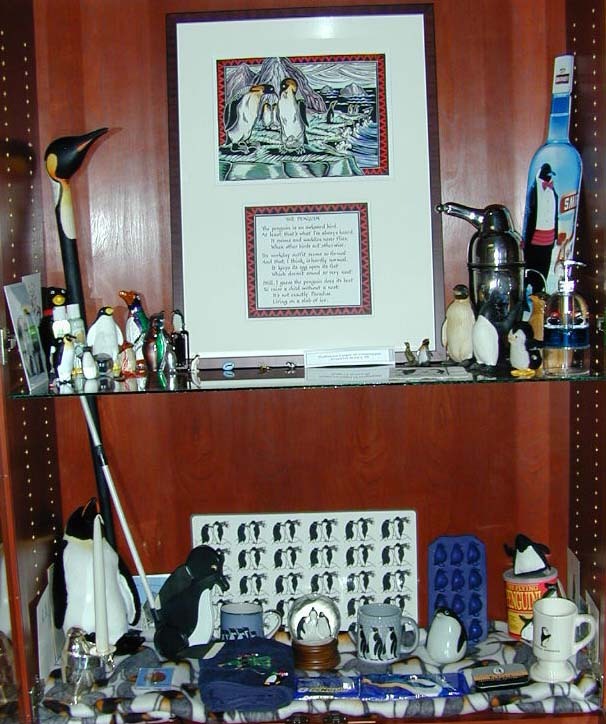 Assorted penguin items in all shapes, sizes and materials. 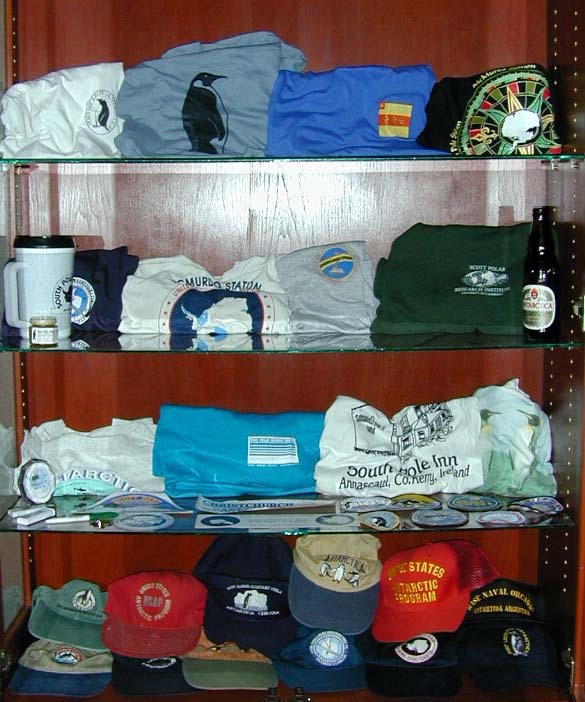 Assorted Antarctic t-shirts, mugs, caps, bumperstickers, pins, patches, cigarette lighters, et al. Etched memorial broadside by W. L. Wyllie commemorating the Scott Polar Party. Map Showing the Work of the National Antarctic Expedition 1902-3-4. From the Georgraphical Journal, Vol 24, 1904. London: Royal Geographical Society. Shackleton's Hut, Cape Royds. From a painting by R. M. Conly, 1973. No. 482 of an edition of 1000. Theatre poster for Ted Tally's Terra Nova performed at the Huntington Theatre, Boston.